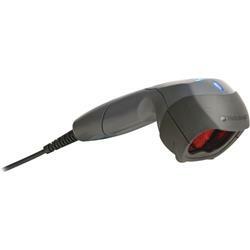 Honeywell's MS3780 Fusion™ is an affordable hand-held omnidirectional laser scanner with single-line capability that increases retail checkout system efficiency with its automatic in-stand operation, optionally integrated EAS, and industry-leading scan performance. Fusion combines omnidirectional and single-line laser bar code scanning into a lightweight, ergonomic hand-held form factor. The 20-line scan pattern provides superior scanning over existing single- line hand-held scanners making Fusion ideal for medium-volume retailers including specialty stores, pharmacies, liquor stores, and convenience stores. An adjustable stand with 50° of tilt and three locking positions provides flexibility for the user to position the scanner for individual comfort and optimal performance. Stabilized with a weighted metal base, the stand may also be hard-mounted to counters or walls. Fusion also includes CodeGate®, a Honeywell patented feature used in the highly successful Voyager® series. An integrated infra-red (IR) sensor automatically activates the laser when a bar code is present. The user then properly aligns the bar code before pressing the button, transmitting the data to the host. This feature provides the ability to pass over other bar codes, selecting only the required code. No other scanner offers this much control. Standard features such as Flash ROM, MetroSelect® and MetroSet® 2 programming, and user replaceable cables protect your investment by enabling Fusion to grow with you and your application requirements.